The BC Lions announced Wednesday the signing of defensive back Korey Banks. The extension is a two year deal which will see the popular veteran remain with the Lions until at least the end of the 2013 season. Banks was entering the option year of his contract and was not set to become a free agent, but locking him for another year is another key core signing for the team this off-season. Banks enjoyed another all-star season with the Lions, the fourth such honour of his career. 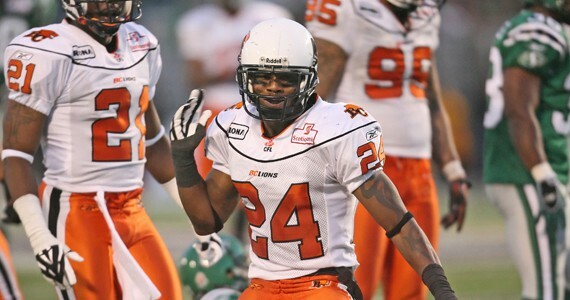 Banks will begin his ninth season in the CFL in 2012, all but two of those have been with the BC Lions after being selected in the 2006 dispersal draft of the folded Ottawa Renegades. Reporters and media members will be happy with today’s news as Banks is known to never shy away from a microphone and provides them with great material for their newspapers and sound bites. Here are Banks career starts, as found on BCLions.com, where you can find the official release of today’s news.